Our daughter was 4 months old before I heard about any support groups for Trisomy 18 - and our care of her was so intense there was little spare time. There was definitely no me time or us time and needless to add - little family time. It was day to day caring for Melissa and meeting all other basic needs. It was a huge relief to connect with a family who had their tips and experience to share. How different today is with the computer age. Melissa was a lot older when we first went on line! Hearing experiences from others is far far better than just reading the text books which here in NZ were incredibly negative and very few tips for providing care. I cannot emphasise enough the isolation and fear we lived with. But there was always that but - we needed to have fun and make memories! Interesting looking back it was me who took our information, charts etc to our pediatrician - it felt like we were educating the medical staff as their response in general was pretty negative. Our next challenge of how Melissa was affected by Trisomy 18. We started taking Melissa out and quickly learnt by experience that she was light intolerant. To the point she could vomit. Also overheating was an issue eg when she was in her car seat. We had to have our vehicle windows darkened and that helped a wee bit. Her clothes were often damp and were changed often - meaning we had heaps of washing to do. Everyday Melissa was our teacher - she taught us Pine trees would cause sneezing leading to vomiting - so our first Christmas we had an artificial tree. 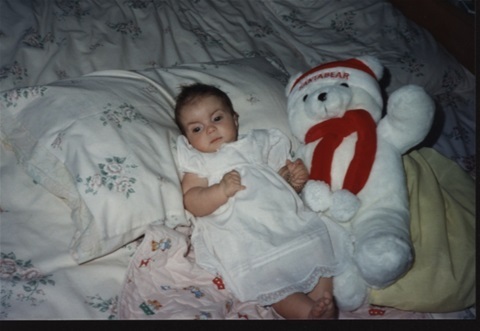 And of course she had her own Teddy Bear. Our first Christmas was so special as from all accounts we were lucky to have made it that far. I still feel it was Melissa who taught me what it was she needed. Amazing how someone who cannot speak can still communicate. Our wee girl taught us so much about life!